400LF-WF is rated 4.8 out of 5 by 5. Rated 5 out of 5 by R42 from Classic & Good Value Replacement for original Delta unit. Works great, looks good. I'm pleased. Would recommend for anyone wanting a classic look. 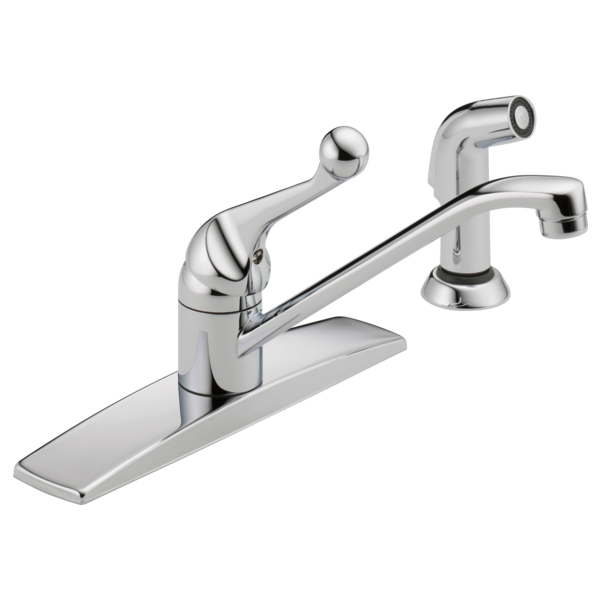 Rated 5 out of 5 by Mike67 from Solid all steel and brass faucet. Made in USA. The only enemy is the water that runs through it. Great design and functionality. The chrome is impeccable and is as good today as when I purchased twenty years ago. Had to purchase a new one only because the water running through is very hard on all the faucets in my home. Delta still honored the life time guarantee and replaced faucet with a 70% discount. A truly honorable American manufacturer. All my business will be with Delta from here on out. Rated 5 out of 5 by Rico from Good quality and simple design. It's nice to find a faucet that is still made of metal instead of plastic. This is a quality item like they used to make 'em and should last for many years. Rated 4 out of 5 by Canyonman from Good value, but not a super professional look when installed. Good product, reasonably easy installation, great warranty. 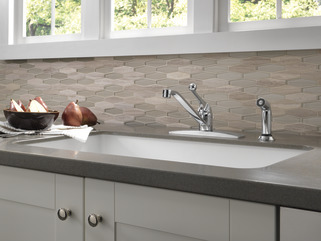 My only complaints are that the base seems a little light and flimsy and the sink "gasket" looks cheap when installed. It's floppy, rectangular, and sticks out around the perimeter of the base and looks unprofessional. Still, most people will find this a very decent product, and it works great. 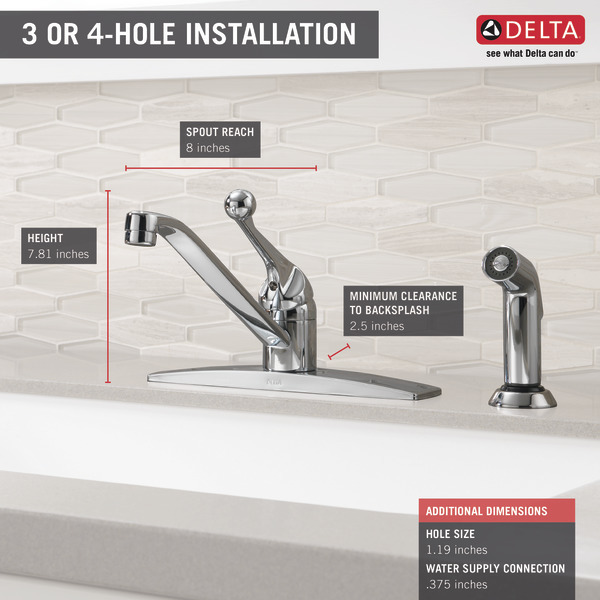 Rated 5 out of 5 by Joegiz84 from New Faucet in Older House When the kitchen faucet in my mother's 60 or more year-old house needed to be replaced a few years ago, the plumber recommended the Delta Single Handle Kitchen Faucet with Spray. The design of the faucet is perfect for the existing double basin sink. 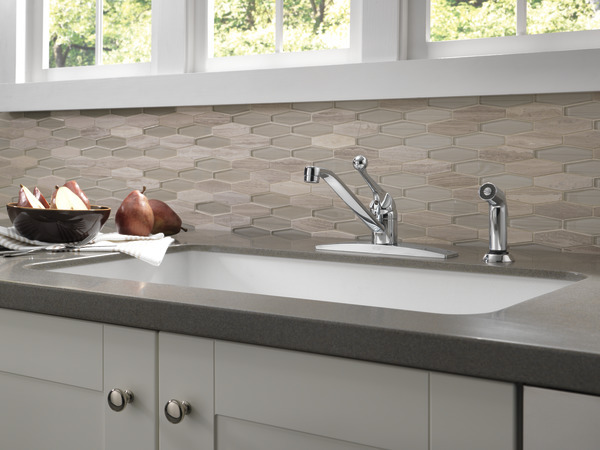 The centrally located spout can pivot to either side of the sink and the hose is long enough to allow the spray to reach both sides. DOES THIS FAUCET HAVE A BUTTON TO COVER THE ACCESS HOLE FOR THE ALLEN WRENCH JUST BELOW THE SINGLE FAUCET HANDLE LEVER?